One of the most common specifications for comparing spectrum analyzers is sweep speed. It is important to understand exactly what resolution is being considered when specifying sweep speed. 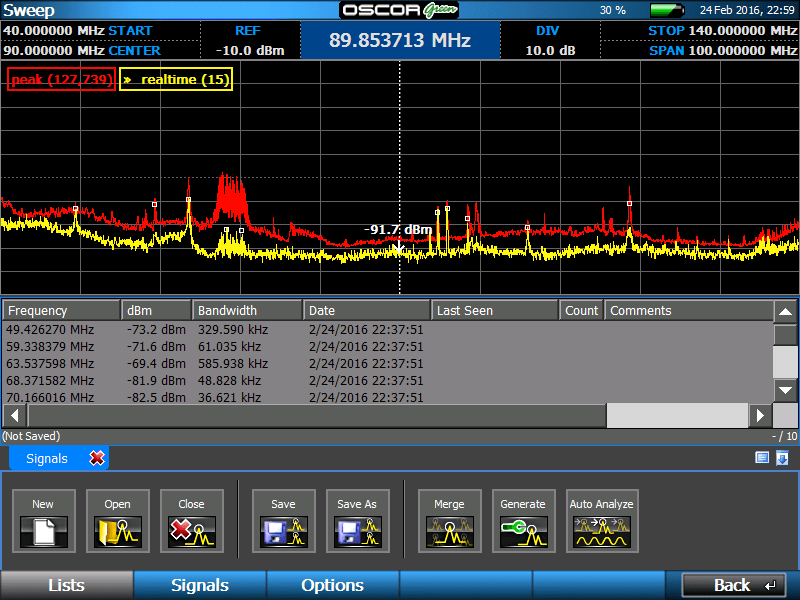 To start the discussion, let’s look at the OSCOR Spectrum Analyzers which sweep from 10 kHz to 24 GHz in 1 second. Therefore, the sweep speed is 24 GHz/sec with a frequency resolution of 12.2 KHz. This means that every second, it produces a trace of 24 GHz span with 2,000,000 data points. Consequently, if you are using an OSCOR and only sweeping 8 GHz, then the sweep speed is 24 GHz/sec, but now the unit covers the 8 GHz span 3 times in one second. Let’s compare this to a different spectrum analyzer, which we will call Product Z, that is a little larger in size to the OSCOR. This particular unit is advertised as the “World’s Fastest Countersurveillance Receiver” and “scans 20 GHz in 20 ms (1000 GHz/sec).” Let’s take a closer look at these claims. To begin, Product Z has only a single antenna input. It is not practical to sweep 20 GHz with a single antenna and have good coverage over the full band. In contrast, the OSCOR has an array of built-in antennas and automatically switches through these antennas as it covers the entire spectrum providing powerful sensitivity that is balanced across the spectrum. In the case of Product Z, the real question is how fast can the user manually change antennas? If you cannot do it faster than five times per second, then Product Z is not faster than the OSCOR when sweeping the full span. Product Z’s frequency resolution is not advertised. However, it does specify a data processing rate of 5,000,000 samples/sec. Granted, this is faster than the OSCOR, but the real problem with Product Z is the resulting frequency resolution when sweeping the full 20 GHz. If the unit can only process 5,000,000 samples per second, this means that the frequency resolution is only 100 MHz when sweeping 1,000 GHz/sec! A 100 MHz resolution means that while the unit is sweeping very, very, fast, it cannot resolve any individual signals that are within 100 MHz of each other. Meaning it cannot distinguish between different FM radio stations or Wi-Fi channels. Figure A illustrates the multitude of individual signals that could be missed inside a 100 MHz span. Having a super-fast sweep speed, but an incredibly poor measurement resolution, is not useful when searching for unknown signals. In this mode, the sensitivity of Product Z is reduced by almost 40 dB compared to the OSCOR because of the tremendous noise bandwidth introduced into the unit. In summary, a 1,000 GHz/sec sweep speed specification is not useful when there are antenna issues and the unit sensitivity and resolution is being reduced to a non-meaningful value. Be aware when comparing sweep speeds and make sure that you have a good understanding of the frequency resolution and antenna switching capabilities associated with quoted specifications when searching for a new spectrum analyzer.